You are here: Home / Everyday Posts / Party In a Jar Book: Monster Slime! I’m so excited to share with you a project from my friend Vanessa’s new book: Party In a Jar! Today…. we’re going to make Monster Slime! Your kids will love making this stretchable, green putty and decorating the jar. After the fun… you can even help your child come up with a name and a story about their monster. The fun learning possibilities are endless. So let’s get started! 1. Paint 6 baby food jar lids in your color of choice. Set aside to dry. 2. 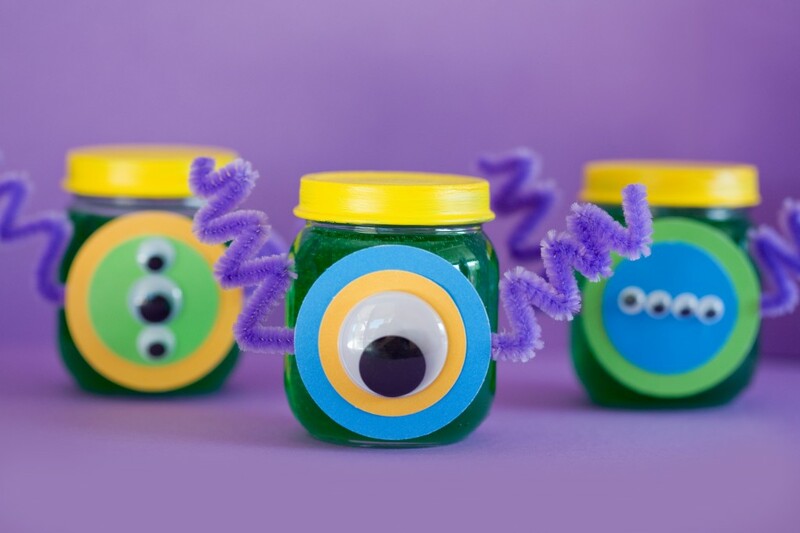 Shape pipe cleaner to look like monster arms and glue to the front of the jar. 3. Cut out 2 circles, 1 slightly larger than the other, out of different colored scrapbook paper. Glue circles to the jar, on top of the pipe cleaner, placing the larger circle behind the smaller circle. 4. Pour 2 – 5oz bottles of clear school glue into a large mixing bowl. Add ¼ cup water and 10 drops of green food coloring, mix well. 5. Dissolve 1 teaspoon of Borax in 1 cup of water and add to glue mixture. Use your hands to mix and knead until a solid glop is formed. 6. Store slime in monster jar when not in use. Be creative and use different sizes of googly eyes, different paper and pipe cleaner colors. You can add some yarn hair, fangs or maybe even some antennas. You can buy the Party In a Jar book on Amazon now!